David Stockman, formerly a leading conservative Reaganite, now blames some of the economic program that he once supported for the 2008 meltdown and sluggish recovery. But liberal Democrats who may be excited about a Stockman defection will be sorely disappointed: His critique of the Obama economic program is just as strong as what he says about his erstwhile friends in the Republican Party. With his new book, The Great Deformation, published today, Stockman positions himself as a whistleblower of the highest order, offering a scathing appraisal of what's happening in Washington. His history gives the story an unusual perspective. In the late 1970s, as a young Republican congressman from Michigan, Stockman was in a group of politicians, economists, and journalists who championed supply-side economics -- the theory that cutting taxes will lead to an economic boom. 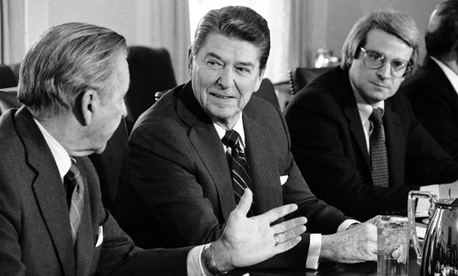 Ronald Reagan embraced the theory in his 1980 campaign for the presidency, landing Stockman a spot in Reagan's inner circle of advisers. After Reagan won, he appointed the then-34-year-old Stockman to one of the most influential positions in Washington: director of the Office of Management and Budget. From that position, Stockman led Reagan's economic program for the next several years. Stockman became an object of controversy in part to the remarkable cover story in the December 1981 issue of The Atlantic, a behind-the-scenes look at the making of budget policy in the capital. "None of us really understands what's going on with all these numbers," Stockman told author William Greider. That article, coupled with Stockman's break with the supply-siders in the mid-1980s, made him persona non grata with many Reaganites. He later joined Salomon Brothers and the Blackstone Group. In Sunday's New York Times, Stockman wrote an arresting diagnosis of the country's economic condition: It's worse than everyone thinks. And he argues that it's only getting darker. I visited with him to discuss his outlook, the 1981 Atlantic story, and the long journey that brought him to this point. The interview has been condensed and edited.